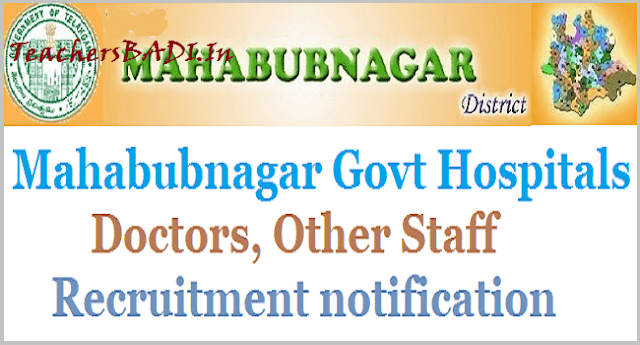 Mahabubnagar Govt Hospitals Doctors, Staff Recruitment 2017 notification: Mahabubnagar Doctors Recruitment, Mahabubnagar Staff Recruitment, Mahabubnagar District Hospital Doctors, other staff Recruitment, Last date to apply for Doctors recruitment, Govt of Telangana, Mahabubnagar, District head Quarter Hospital has given the Doctor posts and Outsourcing posts recruitment notification and applications are invited in prescribe proforma from the eligible candidates from below given dates. Recruitment of Doctors (On Contract Basis) & Other Staff (On Outsourcing Basis) to be filled at District Hospital, Mahabubnagar (DH,MBNR) and Area Hospital, Narayanpet (AH,NRPT) for the Period of One Year. b. 10 Marks = 0.5 mark will be awarded for one completed year of age with a maximum of 10 marks. The age will be reckoned as on 31.12.2016.
c. Merit list prepared based on above criteria will be displayed on the websites www.mahabubnagar.nic.in for transparency and also for calling objections. d. Selection list will be prepared from the finalized merit list duly following the rule of reservations and presidential order. 6 Latest Caste certificate issued by the Tashildhar / MRO concerned. case of Private study residence certificate from the Tashildhar/MRO concerned. b. Filled in application form shall be submitted in person or through registered post so as to reach the office before 5 pm on 07.04.2017 to the Superintendent, District Head Quarters Hospital, Mahabubnagar. Applications which are received after due dates will be summarily rejected. District Selection Committee shall not responsible for postal delays.